If you’re spending far more time than you’d like hand-measuring containment runs, and counting lighting for take offs to estimate a job, there really is another, far easier, way. With Ensign’s Electrical On Screen Take Off Software there’s no more wondering if you’ve counted that fitting twice already or spending hours peering at paper drawings with a scale rule. Let the software do your take off for you, and total all the parts you need with just a few clicks of the mouse; then quickly and easily import your data into our Estimating Software and you’ll have a detailed, accurate and complete estimate before you – or the competition – know it! 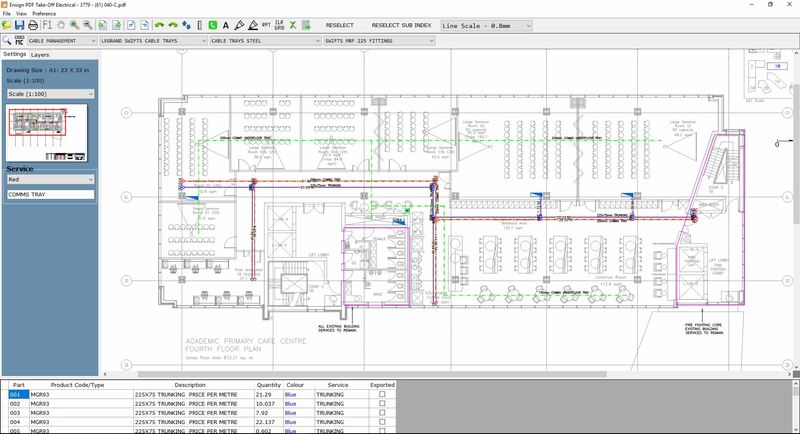 Designed for the needs of electrical estimators, Ensign’s Takeoff Software can count, measure and highlight all of your electrical and cabling needs instantly. Measure containment and cable runs, count lighting, distributions and general wiring accessories and so much more! Select from our choice of composites, such as the 300mm tray and hangers, and the software will automatically include couplings and supports, and you can quickly select and add parts such as reducers, flat bends and tees, where needed. With our manufacturer’s parts database, you can choose exactly what you want, select any occurrences of that part on the drawing, and the software will give you an instant list of how many items there are, with the cost included. The software is intuitive and incredibly easy to use and you can alter the scale to suit, change the view by removing layers so you can see individual parts more clearly, zoom in and out with the mouse wheel, mark up the drawing with text, and even use it as a basic design tool. The time and money saving possibilities really are endless with this amazing piece of takeoff software, and there’s no longer any need to print and transport large drawings to do your job. Ensign are the only company to set up the takeoff software for you and we’ll quickly get you up and running with bespoke training; included is comprehensive support from our experienced team and regular updates, so you’ll always have the latest version of the software. Ensign are the market leader and have the most development experience of this software in the world, so you can be sure your business and your estimates are safe with us. Why contact us today and see how much time and money you could save!